With Black Friday on the horizon and businesses exploring new ways to outperform their competitors, it is imperative to not only think outside of the box but take it that one step further. A Black Friday campaign that offers 30% off, that is only being promoted on your website, sent to customers by email, and posted around social media won’t suffice anymore. Sending your customers a text message when your Black Friday sale starts is just one of our tips to help you jump start your sale and stay one step ahead of your competitors. However, the digital world is evolving and so is SMS. With millions of businesses utilising text messages for a successful marketing campaign, there is another way to make your message stand out above the crowd . . . introducing rich messaging from Messaging Studio. Messaging Studio is our online platform where you can create and send rich content along with a text message to all your customers. 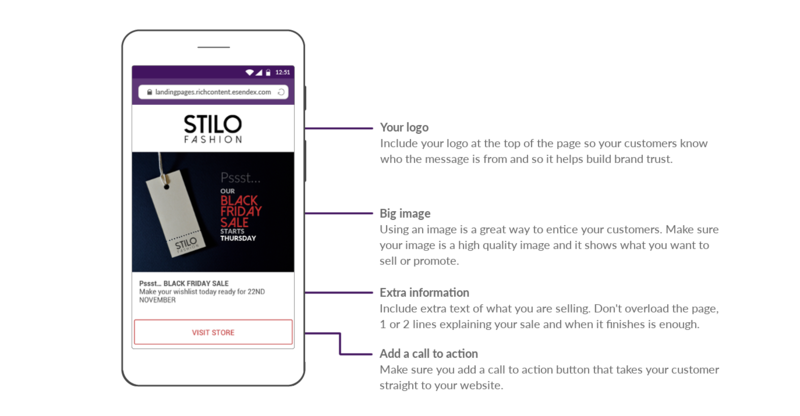 Some of our customers have already seen how rich messages out-perform their usual SMS campaigns aswhen Moy Furniture used Messaging Studio to send an SMS Landing Page to their customers, they doubled their sales because of it. Rich messaging is versatile and suits businesses of all industries, like Four Star Pizza, who were one of our first beta testers last year, used Messaging Studio to send an SMS Landing Page to their customers on Black Friday and saw a 30% increase in conversion rate. When sending you rich text message, it will be displayed as a normal text message with a clickable preview image below the message. To show you the kind of rich messages you can create with Messaging Studio, and to help you boost your Black Friday sale this year, we have created some example Black Friday rich messages all created using Messaging Studio. These are just a few examples of what you can create with Messaging Studio, and we’ve put together some guides to help you create your rich message, so adding your own logo, images, changing the text, and adding buttons are all quick and easy tasks. If you would like to enhance your SMS campaign for Black Friday, please contact your account manager and we can set you up with a Messaging Studio account and help you send your Black Friday campaign.